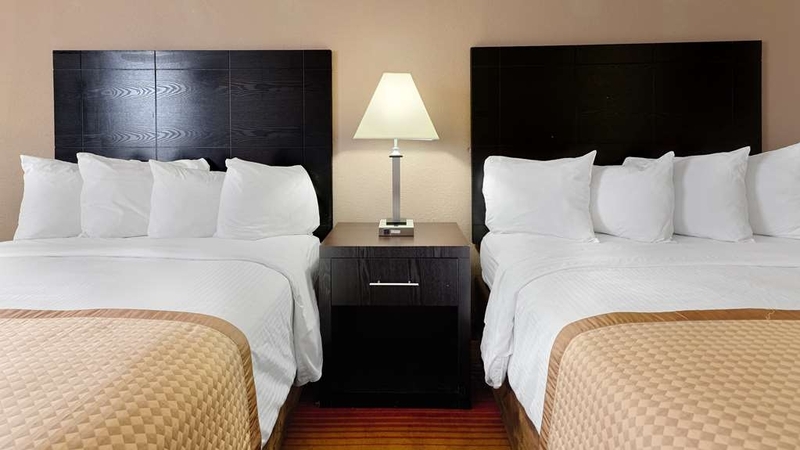 The Best Western Hampton Coliseum Inn is ideally located in the center of Hampton. Come and experience our hotel near the major tourist attractions. Best price guaranteed and exclusive deals. 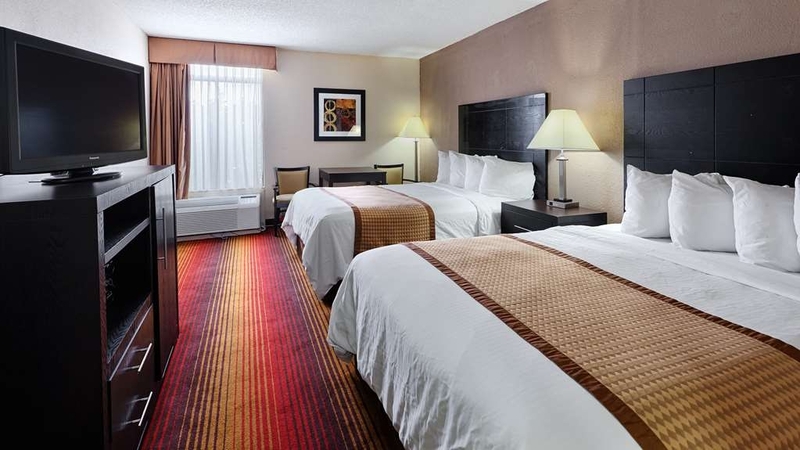 The Best Western Hampton Coliseum Inn is within easy access to the Hampton Coliseum, Hampton University and Boo Williams Sportsplex and Langley Air Force Base. 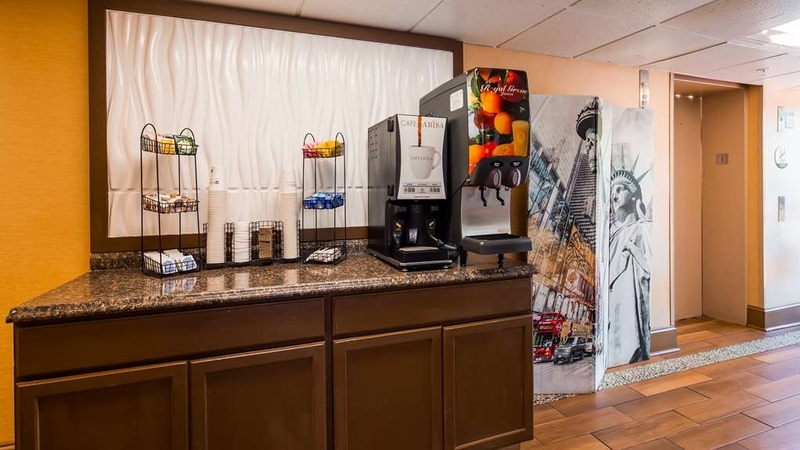 This hotel has excellent access to I-64 and is less than 20 miles from Norfolk International Airport and 11 miles from Newport News/Williamsburg International Airport. Sentara CarePlex Hospital is also nearby making this a convenient hotel for out-patients and family members visiting patients. 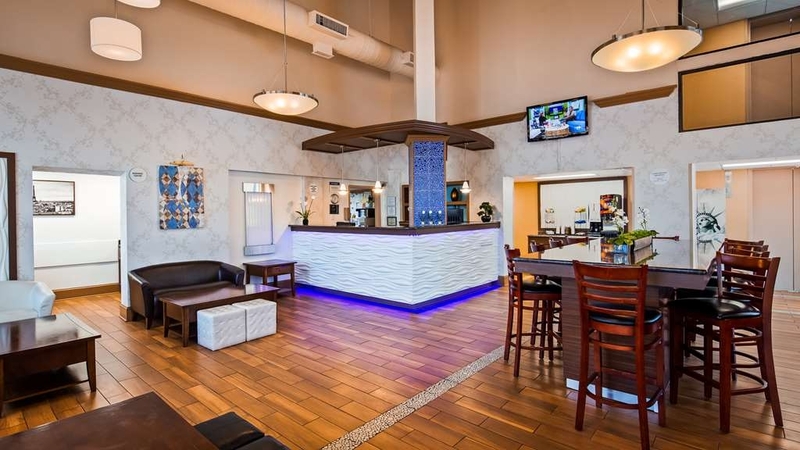 This Hampton, Virginia hotel is within walking distance to the Peninsula Town Center shopping mall where you can enjoy a variety of stores and restaurants. 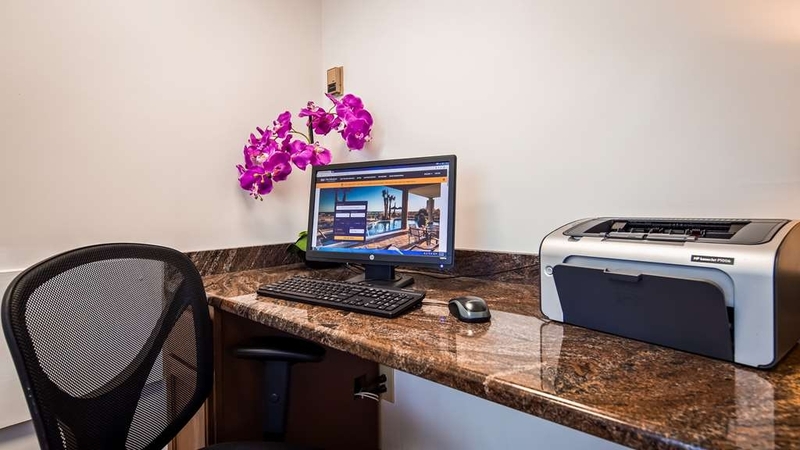 Stay connected and productive with the complimentary Business Center and High Speed Internet access. 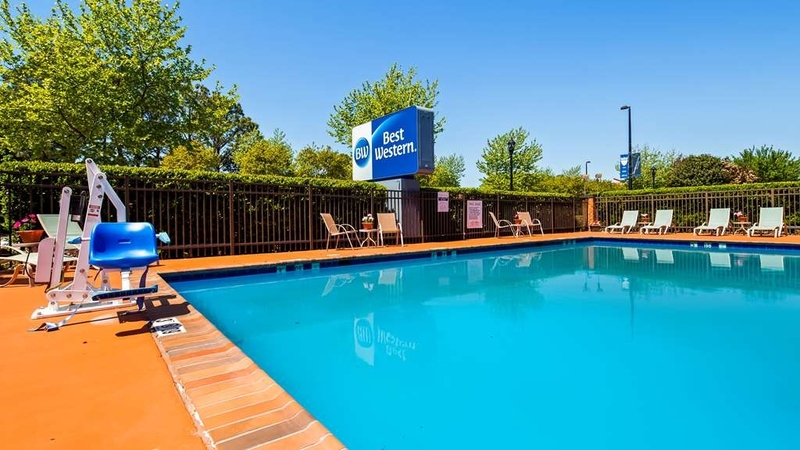 The Best Western Hampton Coliseum Inn also offers an outdoor seasonal swimming pool and a modern fitness center. As an added bonus, travelers are just 20 miles from VA beach. 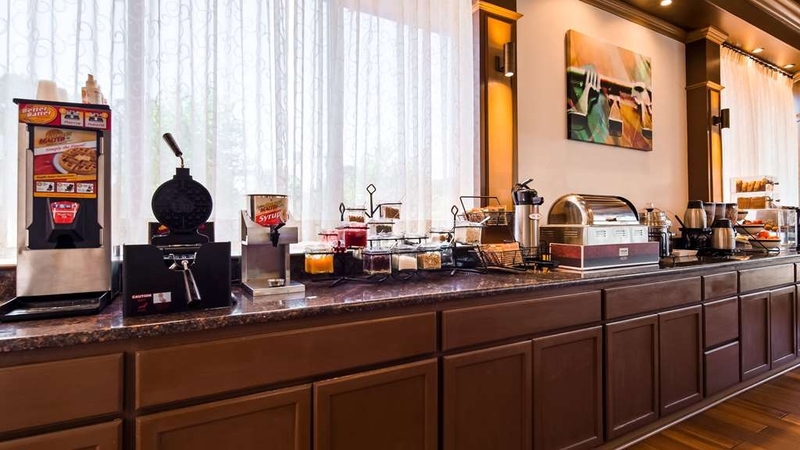 Enjoy a complimentary breakfast buffet which includes hot waffles, a selection of cereals, yogurt, hard boiled eggs, bagels, fresh fruit, delicious pastries, milk, juice, coffee, tea and more. All rooms include cable HDTV with HBO, microwave and refrigerator as well as complimentary High Speed Wireless Internet Access. This Hampton, Virginia hotel is located just steps away from the Hampton Coliseum making it an ideal choice for those attending a conference, exhibition or concert. Free parking for our hotel guests makes exploring the local area hassle-free. The nearby Virginia Air and Space Center provides a fascinating look back at the history of flight, and the interactive exhibits make it fun for all ages. Step back in time with a trip to Historical Fort Monroe. This defensive site proved to be of great importance during the Civil War, and today the Casemate Museum of Fort Monroe lets you relive that time in history. Busch Gardens® and Colonial Williamsburg are only a 30-minute drive away from the hotel. Enjoy your stay! I attempted to cancel and after calling corporate and corporate calling hotel to ask them to cancel my reservation, the hotel manager said no. According to this hotel, I attempted to cancel (according to the hotel clock) AT EXACTLY 4pm and not before 4pm. I went ahead to the hotel the next afternoon (3 hour drive with 2 children just to not give my money away), after checking in online. They couldn't find my reservation. Apparently they went ahead and canceled my reservation at 10:51am on the day of my reservation....but didn't notify me! "Will never book here again"
Worst customer service from this location. I attempted to cancel through customer service BEFORE 4PM. Talked to 2 people at the corporate customer service who then called the actual hotel to try to get my reservation canceled. The woman working there (Mikayla) said there was no manager and the manager wouldn't be there until 9am the next morning to be able to determine if they could cancel. That obviously is not helpful if my reservation is tomorrow. After I asked her to leave a message for the manager, she said she documented it for 4:15 (time our call was about to end). According to them, I didn't try to cancel before 4pm BUT some how I spoke with 3 different customer service people all between 4-4:15.... being put on hold and everything....????? The corporate office claims they really did try to get the reservation canceled but the manager makes the decision, and the manager in this case said no. Actually corporate said that the manager told Kayla (apparently not Mikayla but Kayla this time) that they could not cancel the reservation. Corporate would not give me the managers name. I will NEVER stay at a Best Western based on this experience and I will make sure to put a bad review on every place I can based on this horrible experience AND I will make sure to get the word out to all past, current, and future Hampton University patrons to NOT stay at this hotel. Absolutely horrible customer service from this site. Corporate office seemed like they were trying to get it canceled but it was not under their control. I've been coming to this hotel for the past 3 years, usually on business trips, the high level of attention to great service and comfort provided by the entire staff is unbelievable. That is why when on vacation I use this location as well. "Clean and apparently recently updated"
"Extremely convenient to convention center"
My husband and I visited Hampton VA to attend a RV Camping show, and came up the night before. We'd had a great experience at Best Western in the past and chose this hotel for it's convenience and for our past experience. We were not disappointed. The beds were comfortable, the bathroom was clean, and the hotel was very quiet. The hot breakfast buffet included with the room was wonderful before we headed out for the day! My friend and I stayed at the Best Western overnight. We were attending a quilt conference at the Hampton Coliseum and needed a close by place to stay. This Best Western was within walking distance and had clean, comfortable rooms for a reasonable price. The staff was friendly and helpful and the breakfast was good. Would definitely recommend this hotel to others! I have stayed at this Best Western location four times in the past two years. It is very conveniently located. The staff is always friendly and actually seem to care that you have a positive experience. The rooms are always clean. I always enjoy my stay at the Best Western when I travel for business to this area. When we checked in Kayla was very friendly and informative. My son is stationed at the shipyard and it was cold out so Kayla told us about a go kart place in Chesapeake we really injoyed. Breakfast was great housekeeping was done well! "My Stay At BW in Hampton, VA"
The Staff was friendly, the Hotel was clean that's was it. The water pressure was non-existent and breakfast was well to be polite NOT GOOD. They allow to many people to hang and smoke just outside the entrance, this should be controlled and smoking should be just to the left about 50 feet. My husband decided last minute that he would rather stay in a hotel with more amenities. So I tried to cancel our reservation online (booked on the Best Western Website) and was unable too. So we called the hotel several times and was unable to get a hold of anyone. I went online and sent a message and someone called me back. And we were told we had to cancel it where we booked it from. They apparently cannot cancel over the phone. So we couldn't cancel it. We booked from Saturday to Monday which New Years was during this time. We got checked in a little early. Jon was very friendly! The room was a few dollars more than my reservation said. Got to our room and it was nice, I notice what looked like a blood on the wall next to the bathroom. Cleaned it up no big deal. The beds where comfy and the room was pretty much clean besides that. I personally do not think this room is a good fit for small children. One our kids fell and hit the corner of the wall and got a nasty bruise. Breakfast was pretty good, some of the eggs where old/hard. We enjoyed the waffles and the toppings bar. The kids said the milk tasted old. So we skipped the milk the rest of the trip. I was unaware of the different times of breakfast, I was told breakfast was at 10. Which we checked in on the weekend. The Monday we were there, I went down for breakfast it was a few minutes before 9. (I thought breakfast went to 10) There were other people down there getting breakfast. Someone was making waffles so I had to wait. So in the meantime I made the kids plates. When the waffle maker came free, I went to get mix and only got half a cup. I just made half a waffle and then looked around for an employee to let them know it was out. There wasn't anyone at the desk but I seen a guy cleaning the dining area. I mentioned to him that the waffle mix was out. At first I couldnt understand what he was saying [I sometimes have a hard time hearing] then I realized he was saying breakfast was over at 9. I then said to him that I was told 10 and he just threw his hands up, said something and walked off. I understand he is doing his job but ya know he could of handled it differently. The last night we were there, it was New Years Eve. (I completely understand this was not the hotels fault) As soon as we got back to the hotel which was after 9, you could hear a party from outside. I looked to see if it was our floor or not. Got to our floor and of course the party was a few rooms over. We lucked out and got to our room and turned our fan on and you couldnt hear them. My husband had to run down to our vehicle and by the time he was coming back the cops where pulling in. After that it was pretty quiet besides some unusual noises. Check out was easy and the guy behind the desk was super nice. Overall the hotel was ok, I honestly wish we could of canceled our reservation, but it did save me some money compared to other hotels. Plus it has a good location. The service was great and the breakfast was better than I expected. The bed was soft and the rooms were very clean . My family and I will most definitely be staying in a Best Western Hotel again whenever possible. Hardly slept due to street and parking lot noise. This was a Monday night in early December, not a weekend or summer night during tourist season. Also, there was not one healthy thing to eat for breakfast and no real cream for coffee. Dear Lordiluv, Thank you for your kind feedback. We are happy that you enjoyed your room and the complimentary hot buffet breakfast. It was a pleasure to serve you and we look forward to serving you again soon. Best wishes! In town for a concert, and arrived without a reservation. Staff very accommodating. Had a great weekend. Hotel was very relaxing, and the shower was awesome. Spouse slept like a baby in the bed. Lovely. "Always a pleasure to stay at the Coliseum"
This is a hotel that I've stayed at many times in the last year. The proximity to the base at Langley is what initially drew me to it. I have had nothing but positive experiences while staying here. The staff is friendly and will go out of their way to assist you. My room is very nice and clean! Staff were very friendly especially Ms.Booth who checked me in, check in process was short and simple and she was super helpful with all questions I had :) I had an excellent stay and 10/10 would recommend to anyone! Check in , desk manager Mr Rez, very attentive, polite, friendly and professional. Front desk Melissa very friendly and helpful,thanks the pop corn. Oversized rooms, clean. Bathroom very clean. Nicely decorated room Everything worked. Wifi worked perfectly. Quiet hotel, safe place. Breakfast great for starting the day. Im stay to run Crawlin Crab Half Marathon in saturday and sunday the hotel served early breakfast to runners. Amazing!! Im stay again. Thanks all Staff. I have stayed at this same hotel in different rooms a few times now. This particular visit, we got a room that was apparently made for Giants. I had to struggle to get onto and off of the commode, I am 5'5. (room 202) The really need to up their maintenance of the rooms, and they need more than one person running the show while breakfast is being served. Other than that, I was satisfied. I always enjoy my stay. Melissa Thomas made sure my room was ready and clean. I will be back again. My stay was more of a relaxation trip. Sometimes I like to enjoy time to myself and relax. A little fun is nice to. My stay at the Best Western was amazing, thanks to two of your employees: Marina and Melissa. They made me feel at home, they went above and beyond to make sure I had an optimal experience. Melissa even printed my Basscenter ticket for me when I couldn't get the printer working. Marina always made sure to say hi and ask how my day was doing every time she saw me. It was like having friends away from home. I will most definitely be staying there again next year and will recommend it to all my friends. These girls are great and everyone should take note. Thanks ladies! "Very friendly and helpful staff. Melissa Thomas was wonderful and answered all questions and was extremely helpful with"
The room was extremely clean and comfortable. Plenty of fresh linen, bathroom was well supplied at all times. We really enjoyed our three day stay, wish I could have stayed longer. We will definitely be staying here each time we visit our family i Va.
Great time during check in. Mariana Booth was amazing and courteous. She answered any questions I had and helped expedite my check in. I was in my room in under 10 minutes. Room rates were reasonable, the rooms were clean, and the bed was pretty comfortable. Would definitely stay here again. Had a great stay for the 3 nights thanks to the Mariana at the front desk for answering all my questions and concerns. Right price, comfortable rooms, great customer service, what more can you ask for!!!!! Coming back soon. My family and I stayed here due to Hurricane Florence. The staff here was extremely helpful and every request submitted they fulfilled as best they could. The breakfasts were awesome and even sometimes allowed the breakfast to stay out for late guests so that everyone had a better chance to get breakfast in the morning. When I come back go visit Hampton I will be sure to stay here. "The worst customer service from the GM/Franchise owner"
If I could give this location 0 stars I would. My husband was flying to Hampton on business but due to the impending hurricane his return flight was canceled before even leaving for the trip. I contacted the General manager at this location to get a refund of the room or a credit to use at another time but she refused. She was very rude and unwilling to even speak with me regarding the situation. This is a franchise so the corporate office is unable to over turn the decision of this GM/Owner. To the business owner, Was getting a bad review and losing a customer that frequents Hampton Virginia 4-6x per year worth not transferring or refunding a $100 reservation worth it? Dear Ashley, Sorry we were not able to cancel your reservation. We are cancelling all reservations that are coming in during the storm from September 12 to 15 without any cancellation charges. Unfortunately your non refundable one night reservation for tonight did not fall into that category as the weather is sunny today and tomorrow and airports are open. We apologize again, but hotels do run on a policy. Best wishes. "My weekend stay in Hampton VA"
I enjoyed my stay at this location, it is in close proximity to many restaurants and attractions. I was able to relax in a nicely decorated and comfortable room. The staff was pleasant and very helpful. Virginia I would recommend the Best Western Coliseum. Staff is exceptional. 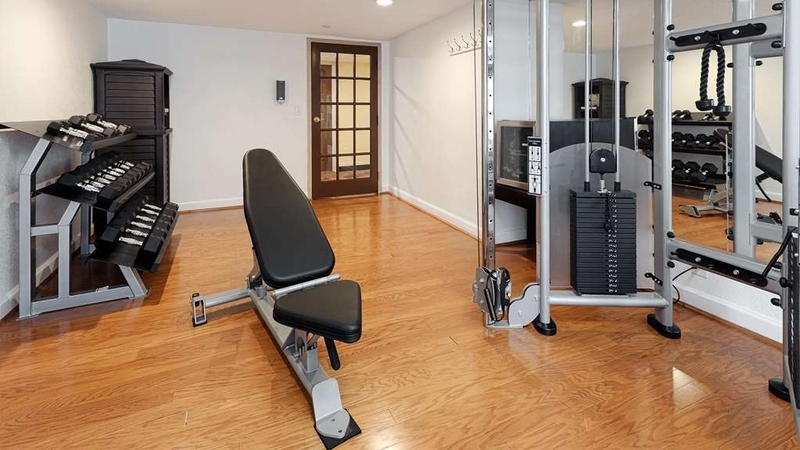 Amenities at this location are clean functional operational and easily used. Check it out I think you'll like it. It is close to everything that you want to see the Museum's the ships the base food shopping and transportation. The hotel was clean. It was quiet. The staff was very friendly. The continental breakfast was always on time, the food was hot, the breads were fresh and it was always well stocked. It's within walking distance to the Convention Center and the Coliseum. We stay at this hotel every year for our family reunion. I have nothing bad to say. The staff was very friendly and tried to accommodate our every need. Great breakfast, very clean hotel, and friendly faces. Looking forward to spending our family reunion here every year. Thanks Best Western. My husband and I had planned a family reunion from the beginning of the year and reserved a block of 15 rooms to accommodate our family and friends the weekend of July 20th- July 22nd, 2018. There was a set group rate and the information was relayed to all family members interested in attending several times over a six month period. However, due to some miscommunication from hotel personnel experienced by some family members about the exact cost of the three rooms they had reserved in advance, led to a very unpleasant confrontation, that although resolved by my family member, really put a damper on our planned activity. To make matters worse, the hotel did NOTHING to try and smooth things over. On top of that, I had spoken to the manager/owner about whether or not it would be ok to use the hotel lobby in the event of inclement weather and though her reply at the time( three months before we arrived) was and I quote, "Sure why not the hotel is yours to enjoy", she changed her tune and said we could not when the day presented itself as rainy. We had reserved an area in a Newport News Va park and it just wasn't something we could follow thru on. To make a long story short, we were able to secure a conference room in another hotel that fit the bill nicely. They will also be the hotel we will use for any future gatherings. Lastly, like my title states, this place was not what I expected. Small. tight rooms with even smaller bathrooms with a toilet that did not flush properly, squeaky beds, computer monitor size tvs, spotty wi-fi, and a breakfast set up that was only fair at best. I will never stay there again and I will not recommend it to anyone else either. We used this location as a base while visiting the Norfolk/Va. BEACH area. Very happy with the accommodations. Easy access to stores, restaurants, and I64. Upon checking In we noticed an issue with the tub/shower control. We were given the option of another room or having it fixed the next day (Monday). Perfectly acceptable. Nice pool area. I loved that the deep end came up to my chin. The menu for breakfast was beyond expectations with eggs, sausage, biscuits and gravy. The only drawback was that the breakfast was in the lobby with one counter height table with 10 chairs. I would stay again. "Small hotel with amenities at a good price"
We stayed here on an overnight stop headed to OBX. I found it through the hotels.com app and chose it because of the amenities (pool, WiFi, fitness room, breakfast) at a low price. The outdoor pool is great! Breakfast was good with lots of selection. The fitness room was dirty and the sticky floor was kind of gross. The hotel staff was very friendly and the ice machine was super convenient for traveling. The hotel is across the street from a mall, where we went for dinner and found a cute playground for the kiddos. The Hampton Police Department is there, too, and we saw a lot of police cars around throughout the evening. I never felt unsafe in the area, but was curious about all the police activity/lights. Overall, it was a good experience. I have stayed here previously, and this hotel never fails to please me. The staff makes their guests feel so special! Breakfast is great and rooms clean. What else would I need! This is my hotel whenever I'm in the area. "Very convenient place to stay"
I have stayed at this location many times for business, and have had positive experiences each and every time. They are very accommodating. One of the best features that I enjoy, is the breakfast offered each morning. It is set up early enough, that I can leave earlier than I can at most hotels, and get my day started. "Great place for a reasonable price"
If you need a place to stay in the area, save $$$ and get free breakfast. This is the place to go. The front desk people were kind and helpful. They even gave us free popcorn and a cookie. It was clean and organized when we arrived and as we left. I highly recommend coming here. Chay at the front desk was very professional with assisting me with getting a room. Chay was real polite and very respectful. She even called the room once i got settled in to see if i was satisfied with the room. Thanks for the great service. The hotel was very clean and the rooms seemed to be recently updated. The breakfast was good and the hotel is in a great location near the colosseum and shopping. The front desk employee Melissa was very friendly and helpful. Enjoyed see you next time. Staff was great room was clean breakfast was good. No complaints. Had a problem upon check-in staff handled it like professionals and made sure we were good. Will recommend this Best Western to anybody that's going to this area. I know when you look for a hotel usually price is the determining factor, however let me say that when you feel right at home do to someone making things easy and enjoyable it is a good pick also. Natasha is the one that made this happen for me. She was welcoming after a long day at work and didn't just sit behind a counter top. She also lifted up her work associates showing that she enjoyed working with them as well. It won't be hard returning to stay here again. Thanks Girl stay great. Oh and yes the room was clean and comfy and breakfast was good as well. From the beginning the customer service was top notch. Friendly punctual and professional. The lady at the front desk name was Natasha & she did her best to get me and my colleague in despite some obstacles she had to overcome My room was nice and breakfast was good thankyou!!!! Dear Oni, We are all so happy that you had a good stay and enjoyed your room and breakfast at Best Western Hampton Coliseum Inn. Natasha sends you warm regards and is glad she could be of assistance to you! Thank you for staying with us. We hope to serve you again soon! Best wishes! "My stay was excellent "
I'm visiting in Hampton because I'm on vacation And The Customer services here was amazing, the staff is very helpful and the rooms are perfect. The breakfast here was so good that I constantly got up getting seconds. Natasha knows how to keep breakfast going. If you're visiting the Hampton roads area, consider staying at this hotel. The stay here is beyond wonderful. Natasha has been great. Her customer service is through the roof and I appreciate her helping me with my stay. Also the hotel itself is kept up great I love this place and will definitely be returning to stay. The location was great since I was in cosplay on Saturday. Breakfast was light but tasty. My room was on the 5th floor, so I had a decent view of an empty lot. The people at the front desk were awesome. Elevator was really hot. Natasha at the front desk is the definition of great customer service!!!! She is so professional and kind. She made sure that everything about my stay was comfortable. I would definitely recommend family and friends to stay at this hotel and tell them ask for Natasha!!! Manager takes great pride in running a wonderful motel. We ( my mom, sister and I )stayed there for 3 nights. Our annual shopping trip. All employees were friendly and very helpful. Rooms are clean and spacious. Breakfast was good. coffee was 24/7 and was fresh all the time. Can't imagine staying anywhere else. We will see them next year. M. Jester P. Platan R. P.
"The owner takes great pride in his hotel"
Title says it all ,if you have a issue he will fix it. I don't know what else to say, the rooms are clean, staff is friendly, the breakfast is right there in the lobby, so you can just grab and go in the morning. "3Rd Stay Was the Best Stay"
B/W Hampton Coliseum Inn, First stay was good second stay was just So-So. We took a chance and stayed a 3rd time, it was very, very enjoyable. The small inconveniences of the second stay were corrected, refrigerator and ice maker were working and most importantly there were lids for the coffee cups. My wife and i will definitely stay at B/W Hampton Coliseum Inn again and would recommend this hotel. My wife is still talking about how good the free complementary popcorn was that was offered to us upon arrival..
"Nice place will stay here again"
Previous reviews I have read about this property are really blown out of proportion or the people who wrote them don't even like their own home. I have stayed at this property since before it was a Best Western. ( 20 + years) And through all the different managers if there was a problem it was taken care of immediately. It's an older building so it will have challenges, and maybe even a spider or two...so just kill it and move on. The improvements that the new management has made are very impressive. The room and bath were very clean, the bed and pillows were great, and the breakfast was hot, tasty, and a great selection. The staff went above and beyond to make my stay pleasant. people need to give the staff and management a chance to fix things before they start sounding off on public media. Especially when most of them have no clue as to what it takes to run and care for a lodging facility. (And yes, I do, 25+ years of experience.) I can promise you this...if this place sucked, I'd be the first tell you. Great visit. Friendly Service and staff. Very Clean throughout. Far Better than the average double digit hotel. Varied breakfast meat for each day we stayed. A winner, I'll be back. Owner/Manager comes out to meet./greet as does his wife. "Great Stay for the value! " Thank you for taking the time to review our property. We really appreciate the kind words! 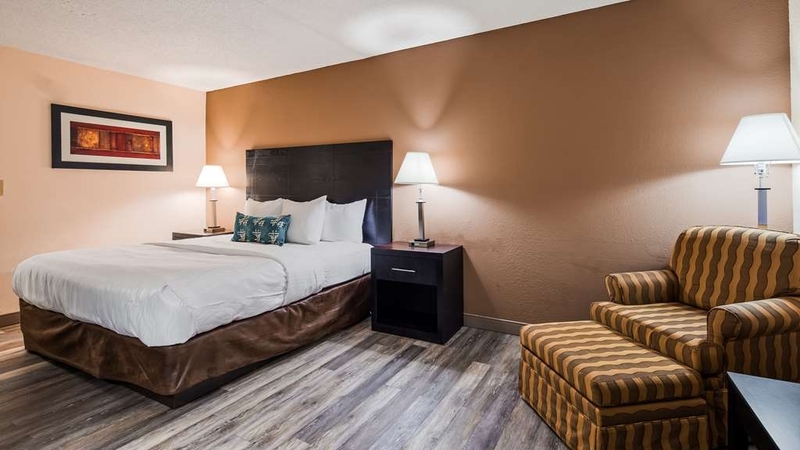 Here at Best Western Hampton Coliseum Inn, we do make sure we provide clean and comfortable accommodations and that our guests are well taken care of. I'm so glad you had a comfortable stay. Ladda sends best wishes and we all hope to serve you again soon. I found a HUGE bed bug the morning after our first (and only) night of the stay. We left and were promptly refunded for our stay, but it was *not* a good experience. They were nice to us and the hotel seemed alright otherwise, but I spent 3-4 hours decontaminating and at least $100 on products upon my return home. Not a good experience. "Very Good Hotel For Price"
Upon arriving at the Best Western, I was promptly assisted with check-in without any hassle, though this location only had two carts. The hotel was a wonderful stay for an affordable price with an average breakfast (though there weren't a lot of vegetables being served at the time.) Would stay with this hotel again for local conventions. The staff were very helpful, even at night! Thank you, Best Western! "A couple of hiccups but a great stay nonetheless"
So this hotel was great... They allowed me an early check-in when I called about it. They we're very friendly. If you left a note for housekeeping they read it and did what they could. The only hiccup was my tub being clogged. But it was fixed by the end of the night so it wasn't a big deal. And during my convention there was a lot of people staying in the hotel so seating at breakfast was a little weird. They have just one island that has like 10 seats around and then a few couches. So if you didn't wake up early you had to eat in your room. "Amazing place to stay for convention goers." 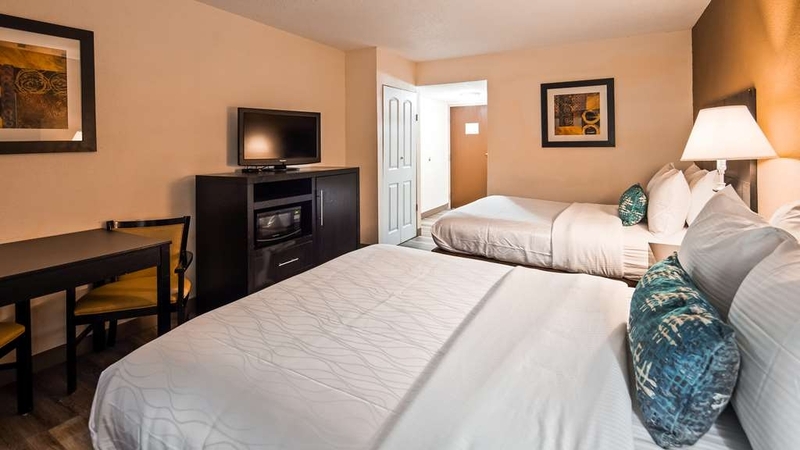 If you're a group that likes to attend conventions, Best Western on Coliseum dr is the perfect place to stay! The convenience of the hotel to the convention is not that bad of a travel. My friends and I had a great time and we will definitely book at the same place again next year. I'll be sure to let the rest of my friends know where to stay when they attend the same convention next year! I wouldn't recommend this unless you needed a last minute place to stay. I feel like more things could be improved here. The breakfast was alright. There should be a check on spiders and multiple wasps around the building/ certain rooms. The service was nice and understanding. We had a very comfortable stay at this hotel.. no complaints! staff was caring and rooms very clean. Breakfast was nice too. I will recommend to friends for sure. It was good value for my money. I will stay here if returning to Hampton. Dear Tim, Thank you for the kind feedback. We really appreciate the positive comments. We are in the process of changing the flooring in our rooms and next time you visit I would love to hear your feedback on that as well. Come see us again soon. The most pleasant and helpful front desk personal we have ever experienced in all our travels . We would certainly stay at this hotel again if ever in the area. The value for our money was exceptional. "Fine people and great stay." All of the people that work there are the ones that made my stay great. Sure the room has to be clean but its the people to me who make all the difference. The front desk staff and cleaning department make sure that you are well taken care of. I will be returning! Needs complete renovation, it's old and shabby looking and I would have paid more to stay someplace nicer. Carpet was worn, drapes coming off hinge and room was just shabby looking. Would not stay her again. Lady at check-in was very nice. breakfast was ok.
"Highly convenient, really friendly and helpful staff"
Drove into Hampton for a half-marathon last night. This hotel had a room I booked yesterday. Lady at the front desk was helpful last night, late check out for runners? No problem. Helpful advice on where to eat. Late night coffee and water in the lobby. Clean room. Continental breakfast in the am, attentive guy cleaning up after guests. Reasonable price. Easy walk to Coliseum. I was expecting a usual stay while on business in the area but this hotel was such a fantastic surprise. Check in was quick and all the employees were all so kind and helpful. What stood out was when i came downstairs for a quick breakfast. I expected the usual small samples of a hotel breakfast but there were just so many options! It ended up being a delicious start to the day! i still think about those chicken patties! Rooms are more than adequate; spacious; included microwave and larger fridge than expected Extremely friendly staff, especially during breakfast Wonderful amenities Please note; you have to request your room to be cleaned on the weekends. We stayed here for one night. The building is clean, rooms comfortable, and breakfast really good. They don't have a separate breakfast room, the breakfast is served in the lobby, but it wasn't inconvenient. I will stay there again for the value and service! I stayed for one night in September. The hotel was in a safe area, clean, and comfortable. I didn't have time for breakfast, but the spread looked decent enough. Very helpful and friendly staff. Free coffee. I usually travel for business and this was my first time at a Best western. A last minute thing.. what I liked most was the way the staff treated me.. like I was an old friend! Breakfast was hearty and enjoyable. I will definitely try other Best westerns now. "not quite The Best Western"
The rooms are clean and comfortable, as is the lobby. The grounds not so much. The staff is pleasant and professional. The "Complimentary " breakfast was the low point. Try Waffle House at the corner. Stayed here for the Bassnectar concert and it was amazing. Clean rooms, comfy beds, and super super nice staff. Only complaint would be that the shower curtain was a little bit short. But other than that I loved everything about the hotel. Will definitely book here again whenever I'm at the coliseum. "Desperatly needs update, but beds comfortable"
Carpet ill fit, has odor, paint in rooms mismatched, patches- needs TLC, recent furniture exchange but didn't bother with wall/ flooring. Not a fan of carpet= it holds odors and body fluids. Staff very polite, breakfast was ok. Beds comfortable. Bathroom small. Was ok for a 2 night stay- better than some other hotels in area family stayed in for a wedding. My husband is a commercial fisherman and he docks in Hampton, When he is here I usually bring the grandkids for a road trip. We enjoy staying here, especially wifi in rooms:) The kids also thoroughly enjoyed the breakfast and the pool. All staff were very friendly and courteous. The rooms are clean. 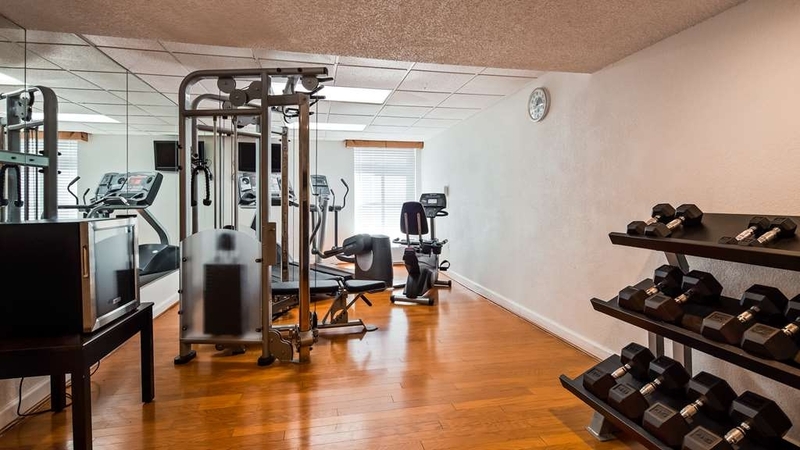 "Decent value, but you get what you pay for"
Beds and pillows, fitness center and staff were great. There seemed to be something not quite in perfect operating order with several aspects of the rooms. We reserved two to accommodate our family. Plan on a backup for your breakfast if you have dietary needs beyond processed and generic buffet hotel fare. 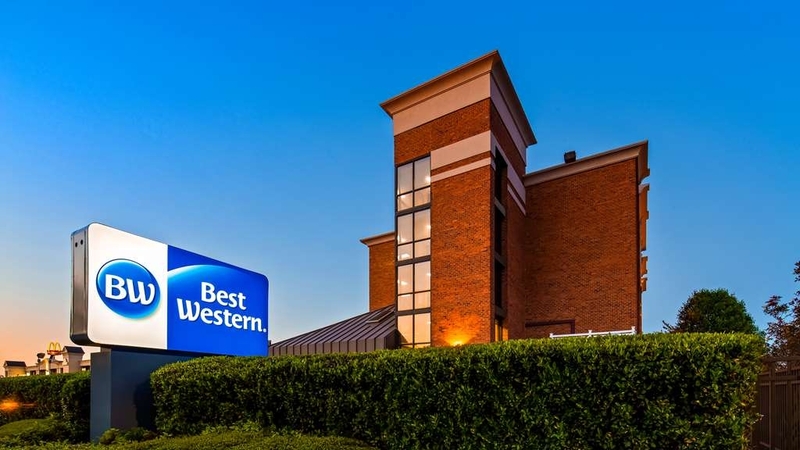 "Excellent Experience at Best Western"
I recently visited Hampton, Virgina and my stay at Best Western was truly amazing. The staff and management were very friendly and went out of the way to make my stay comfortable. Very clean and close to many historic sites. "OK Place to Stay for a Few Nights"
It's not bad and it serves it purpose. The price could be lower even with my AAA membership. The staff there is nice and my kids enjoyed the pool. The location is great with so many restaurants to choose from and not far at all from Buckroe Beach which was really nice. "Exceptional comfort and ease of stay"
I tremendously enjoyed my stay at this Best Western. From check in to check out, I was amazed at the attention to detail the hotel's management and staff seem to have put in. Upon checking in, I was pleasantly surprised at how friendly, helpful, and warm the staff was. 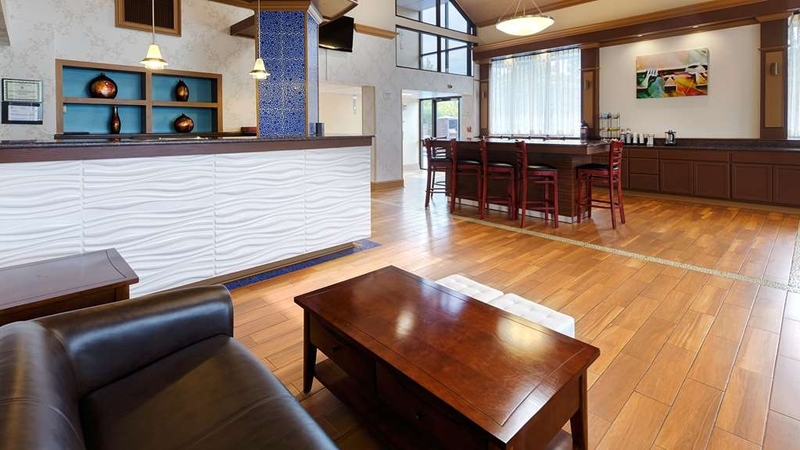 I also quickly noticed that this hotel's lobby and welcome area are extremely clean, unlike a lot of comparable hotels both in the region and across the country. Upon entering my room, I was met by an exceptionally comfortable bed, well-furnished bathroom fixtures, and an impeccably clean living space. Throughout my stay, every interaction I had with staff--from management, to front desk, to housekeeping--was top notch and reflected the professionalism of the entire business. I would enthusiastically recommend this hotel to anyone visiting the Hampton area and looking for a quality stay at an unbeatable price--both to frequent visitors as well as first-timers. The first room I was issued smelled like someone pored a bottle of cleaner in the carpet which caused my kids to have a headache. The front desk assigned me another room which she checked and said it did not have an odor. The 2nd room sink handle would not stay up and you had to hold the handle down to flush the toilet. The chairs had stains in them, overall pretty gross. Around 2am we woke up with ants in the bed and the next morning tried to take a shower and the water would not get hot, was barely warm a little on the cold side we also had to fight the shower drain to stay open. We checked out 3 days early, the manager still charged me for one night and no apology only comment he made was we spray every month, called customer service and they could not issue a refund they offered me 6000 points. The only reason they got a 1 is because I could not leave it blank. Was not satisfied with my stay at Best Western Hampton Coliseum this past weekend. The staff is very friendly, I enjoyed being around them. We drove 10 hours for a family reunion, my room was leaking water over the toilet so I'm taking that it was leaking from the bathroom above, I reported it and wasn't able to receive another room until the next day because they said the hotel was completely packed. Asked if I could be given a discount on my room and they said I would be able to speak with the manager, well nothing was done. Changed to another room the next day and go in the closet to get iron and ironing board out and there's someone else's dirty clothes left in the floor. Carpet needs to be replaced, smoke smell has settled in it and it is bulking up in spots. Several of my cousins who also checked in complained of nasty rooms and wanted their bedding replaced due to stains on them. I was not satisfied with this hotel and the drive some of us took we wanted to come in and feel comfortable. Definitely not worth the money that they charge for their rooms! If you look forward to making reservations and Best Western Hampton Coliseum Hampton, Va pops up KEEP SCROLLING! Among the hotel I'm been stay this the hotel I considered People's Hotel because all kind of ages of guest I see to this hotel when we stay. They are happy even in a short period of stay. Front desk associate are friendly and accommodating. If you just the person not really picky for fancy and extravagant hotel I recommend this.. Nice and clean and close to all establishment you looking from store, restaurant and recreation. Booked a room for a get away trip with my two sons, We enjoyed the day and checked in at around 5. , I had reserve a room 3 days before we arrived but when we arrived had I apparently reserved the previous night. My bad!! They were very nice and even gave me a discount for my mistake on our room that night. Accommodation were nice. Breakfast was good. Gotta love those waffle makers! No issues with the room, Very clean. Has Microwave, fridge and TV of course. Room was spacious and beds comfy. Has swimming pool, located near the Bass Pro shop and Hampton coliseum .Not far from NASA Space and science center and Fort Monroe. This hotel looks old and shabby. While the lobby and pool was clean and inviting, the rest of the hotel and my room looked tired. The rug in the elevator and the hallway rugs need replacement. The shade curtain had multiple holes, the door lock did not work properly without multiple tries or having to slam the door shut, the handle was broken on the nightstand, and the maid did not service my room while I was gone for the day. "Do Not Stay Here! Roaches in rooms & very rude manager." Had one of the most comfortable and accommodating hotel stays. Staff was warm and went above and beyond to address my needs. No issues with wifi or check in/check out! No surprise charges. Very pleased with service and highly recommend for business or pleasure! Mr. Monty was very knowledgeable of the hotel and the area. He gave me tones of food places within walking distance of the hotel. The kids loved the pool! I was able to relax while monty made sure we were okay ! He gave the kids clean pool towels and helped us find the ice maker! That man needs a raise! I haven't stayed here at this location before, so I really didn't have expectations but whoever the young man was at the front desk sure was amazing! The hotel could use some detectable maintenance but Monty came up from the front desk came up and serviced the room and really showed that he cared! "Hampton Best Western Colesium Hotel needs lot of Internal Attention"
Have stayed here at this location a number of times in the past two years and this visit really fell far below my expectations. TV TV Remote did not work, no ice in either of the two machines, either day, and last time I was there only one machine on ground floor was working-barely, drink machine was out of order on my floor, breakfast was far below my expectations Saturday, looked at layout Sunday and went to Waffle House, staff member promised to call me when the Ice came in Saturday evening, never got the call and was able to beg a large lump for my meds in small cooler.Really a lot of noise with kids running up and down the halls early in the evening Saturday (my room was on the fourth floor) I think I will try the Holiday Inn or Marriott next trip. This was a trip I used points for the room and Wow!!! It was expensive points wise. Great hotel experience. All the staff was super friendly and approachable. Pool and hotel lobby were clean and maintained. The hotel room was clean and had everything we needed. The location of the hotel is nice too. It's a 5 to 10 minute walk to A town center area where there's restaurants and a sit down eat movie theater. We had a nice room, it was perfect for us actually. We were attending a jazz festival at the Coliseum, and we could actually walk over there, no problem. Also, it was a $6.00 Uber ride back. There is also a fridge and a microwave in the room. Our stay at Best Western Hampton Coliseum was special due to the front desk attendant Chay. As soon as we walked in she greeted us with a big smile and provided a welcoming atmosphere. She also went above and beyond to help us book another hotel reservation. We gave 5 stars because of Chay! Thank you Chay for making our visit exceptional!!! I like quite, laid back locations. This hotel is small 5 floors. The staff is very professional and genuinely kind. Great breakfast. They do not rush people to finish eating. The area is very nice and safe. free parking. Every type of restaurant surrounds the area and the mall has every store that you can name and then some. I will definitely be back for a shopping trip soon. "will give this hotel another try"
This was my wife and myself`s second stay at this hotel, last Christmas we gave the hotel a very good review. The in room refrigerator was not working, when we explained this to the clerk we were told that there was no one on site that could replace it. The next morning we explained the problem to the another clerk and was told it would be replaced ASAP.Came back later that evening with a few snacks and drinks only to find that the refrigerator was replaced with another non working refrigerator and non working freezer .. now i had nothing working (at least the freezer was working on the first fridg.).. also the community ice maker was making very slow, wet ice in the afternoon ( i thought it may have needed to make more ice), however went down at 6:30 am to get ice SAME very SLOW, WET ice... No working Fridge, No working Freezer, Un-usable ice maker. To make matters worst, i could not even take coffee with me for my trip home, coffee cup lids did not fit, clerk told me that the small lids was all they had. Dear Antonio. We appreciate your time, and thank you for the feedback. Please do stay with us again. I'm use to staying at the Hilton and/or Marriot. My sister and I wanted to be within walking distance of the Hampton Coliseum For a BW it's not that bad however I used my Best Western points to stay at this site for FREE during the ever so busy weekend of the Hampton Jazz Festival, this past weekend. Although we showed up at noon Ms. Valerie got us into a room before the normal check in time. We were slated to attend a concert at the Coliseum at 2pm thus we need to unload our luggage and change into our clothes. Once we got to our room we noticed a tissue on the night stand. As I made may way downstairs to get my bleach wipes; Ms. Valerie saw me and asked was everything was okay. I informed her that there was a tissue on the night stand however everything else seems okay. She immediately left the check in counter and accompanied back to my room. She apologized and then called the cleaning crew back down to our room for another walk through. Dear Tameshaw2017, thank you for your review. Valerie sends best wishes and appreciates your kind words. Please do stay with us again soon. Best wishes. Had reservations for two rooms for the Hampton Jazz Festival. The staff was nice and we were given joined rooms. When we first arrived there were dead, frozen baby roaches in the freezer in one of the rooms. They staff came to clean it after we called. The room safe in both rooms did not work; no big deal to us. It was very hot outside and one room had the A/C shut off and was roasting hot. We just opened the joined door and turned the A/C on cause the other room was nice & cool. That night after the first concert and 1 am we returned to our rooms and were hanging out. My room was cold so I turned the A/C down a bit. After about 10-15mins, my friend said there's a big roach crawling on the refrigerator cabinet. This was in our second room which was my room; my family members had the other room. I killed that roach then about 5 mins after that two small roaches started crawling around my friend's drink sitting on the night stand. Immediately called the front desk told we were leaving because they had roaches. At around 2 am in the morning, we packed up both rooms and had to move to another hotel. We did get a full refund after telling the front clerk to call a manger while I was shaking my belongings out in the lobby, so I wouldn't take roaches with me. Don't stay there!!! Thanks for taking the time to review our property Katrina. We are sad that you didn't like your stay. Hopefully you will give us another chance to change your opinion about us. Thank you again for your time. I stayed one night in the hotel and had a horrible experience...the neighboring hotel was conducting a loud block party until 2am that's noise/music drifted to our hotel not allowing us to sleep/rest for productivity in our business the next day. When speaking with the concierge we were told there was little they could do because the neighboring hotel had filed for permits for a block party until the early morning. The front desk staff was unaware of these details and failed to research the situation properly so we were forced to bear the loud music until past midnight. They also failed to contact the police accordingly or inform us once they learned of the 2am party stop time so that we could make a decision regarding booking at another hotel or to stay. I really enjoyed my stay here this past weekend. The hotel was clean with a modern lobby. The location was safe and filled with restaurants. And it was very close to the convention center. Just need to stay here another time to try the pool! Dear D0c314, thank you for the kind words.. it makes us want to work even harder to provide a greater experience to our gracious guests. Hope to see you again soon! I was visiting for a conference. When I booked my reservation online I thought I was booking with this hotel near the convention I was attending. When I arrived I found out the hotel which I booked online was a DANGEROUS RAT-TRAP in Norfork, VA going under the name of "BEST WESTERN" . The young lady at the front desk of that location understood my extreme dissatisfaction and help me get a room at the "REAL BEST WESTERN in Hampton, VA which was my initial choice. "Best Western Hampton Coliseum Inn, Hampton, VA was absolutely lovely and very accommodating in putting me up for the 3 nights I needed. They went out of their way to assist me. The young ladies at the front desk were great. The room was very clean, breakfast was nice, though choice slim. Area is very safe, and outside amenities close by. I would recommend this hotel to all. Next year when I come to the conference at Hampton University I plan to book with "Best Western, Hampton, VA. I hope that other place in Norfolk will cease to use Best Western name; it's a DIVE and very unsafe. Be careful of the hotels you book online. "WANT A LAUGH? READ MY REVIEW LOL"
Thank you 649karlz.. we hope to see you again soon! I will make this shirt and to the point! If you attempt to check into this facility and you do not see KATHLEEN.... turn around and find some where else to stay or you will be in for the worst hotel experience of your life! FIRST LET ME SAY THAT THE STAFF IS GREAT!! At least one person on the staff! IF NOT FOR THE GREAT YOUNG LADY AT THE FRONT DESK KATHLEEN!!! This Memorial Day weekend would have been a total disaster! Just because THE MANAGEMENT SPRAY PAINTS BLACK MOLD GROWING IN THE BATHROOM DOES NOT MEAN IT TAJEN CARE OF ! My room was not cleaned for TWO DAYS! That's right TWO DAYS! Each Evening we returned the beds were not made, no clean linen, had to go to the front desk and ask KATHLEEN for towels. If you get to the front desk and do not see Kathleen turn around and leave! This is not the place you want to stay! "Sufficient for a night's sleep"
Staff was excellent, but the rooms were kind of gross. They need a lot of repairs, and there was a big old spider web right above the pillows. The location was, however, very good. Close to the mall and the interstate. This hotel was average but worked well for a one night stay. It was fairly clean but there was evidence of water damage in the room. Slight wear an tear in the room. Remote was inoperable. Vending machines not stocked. "Simple and Good and Inexpensive"
Great Stay at the Best Western Hampton Coliseum. The accommodations were good, clean and functional. Internet was fast, breakfast standard but fresh. Check in and checkout procedures were speedy and accurate. I've stayed at several locations, NJ, VA, and every stay has been professional, friendly, clean. The staff at all were great! Try Best Western Plus Governor's Inn, at 9896 Midlothian Tpke, Richmond, Va. It's a wonderful, place to stay also. Dear glo42, we appreciate the time you took to post a review for our property. Thank you for your encouraging words and your loyalty to our brand. Come back and see us again soon! Our first room had a broken security lock. Hotel staff kindly switched us to a different room. Second floor hallway greeted us with the smell of pot coming from a room across from ours. But it didn't pose a problem for us. Once in the room all was fine. The hotel lobby was very nice and breakfast was pleasant. We had two rooms and stayed just one night. It was a nice place to stay. The hotel was very clean. The price was good. We had a problem checking in due to Bookings.com, but the woman at the front desk figured it out and got us checked in quickly. The free breakfast left a lot to be desired. You can make your own waffles, so that was okay, but the other hot food needs to be removed. I would stay here again if it was just for one night. "Good place to stay but nothing special"
This is a smallish hotel, 5 floors of rooms but not many per floor. There is a small outdoor pool but it wasn't open yet in early April when I stayed there while attending a conference at the nearby Hampton Convention Center. The room was clean and it was nice that the window could be opened for fresh air. Good flat-screen TV that worked well, clock, comfortable bed, desk with adjustable chair and another sitting chair and ottoman. Lighting was good too. In the toilet a hair dryer was provided. An ironing board and iron were provided in the closet. A safe was provided in the room also, and a microwave. I didn't need to use the AC or heat but it was a separate unit rather than a wall thermostat. Gripes: the tub/shower faucet had a drip that wouldn't stop. The towels were clean, but small and rough. The hotel provided shampoo only and the soap bars were small. There was a hot breakfast with powdered eggs (but real hard boiled ones) and sausage patties, and the usual do-it-yourself waffle maker. Thank you very much for taking the time to post a review for our property. We at Best Western are always thrilled to have gracious guests as you and always rely on genuine reviews such as yours to improve our services. Thank you again and I hope you will give us the pleasure of serving you again. It was fine. But not worth the money. It was a good location but creepy on the outside. I didn't feel very safe. But inside was clean but the building felt old. Just disappointed in the price for what it was. My stay was alright. Bed was good. Average hotel not worth the money I paid for one nights stay. Upgrade rooms to latest shower heads. If room is damaged by previous renter then fix the problem and then rent room. "Needs updating and a good cleaning"
Check your mattress for urine stains and bed bug feces. It looks like they haven't vacuumed along the wall edges in a while, and the carpet feels and looks dirty. The AC unit smelled sour and musty. Most (not all) of the staff is unfriendly and in no hurry to help with anything. I did receive prompt night service when I requested extra blankets. "Overnight Stay for Beach Trip"
Stayed here for one night on the way back from the beach. Bed was comfortable. Room appeared updated and had ample outlets for technology. Wi-Fi worked fine in my room. The only concerns were that the carpet seems dated and that the breakfast was cold. They did not offer much for breakfast, so I would recommend going out to eat if you want more. Property is next to a large amount of restaurants and shops. Beware that it is near the interstate, so you can hear cars during the day. I might stay again, but I would also consider other properties in the Hampton Roads area. I have been traveling to Tidewater for more than 20 years, and finding a safe, clean, quiet, Adult friendly, comfortable and Value for dollars has become a daunting task. I have recently stayed at the Holiday inn, Hilton , and Marriott on the street leading to the Convention Center and finally got a good rate at this Best Western so this is my third visit to this hotel. The only problem I had was an inconsiderate guest next door talking loud at 11:30 PM. I called the front desk and moments later I heard their phone ring and it then got quiet for the rest of the night. The layout of breakfast was certainly adequate and a good variety of food. Parking for Handicapped ( I require) really needs a couple more spaces, as it was filled both evenings when I came back from business. I did notice the lot was well lighted, no foot traffic from "street people" observed at this location, probably due to the hotel location and Police presence highly visible in the area. "Fire Alarm, No Juice at 6:30 am"
The fire alarm went off in our room around 2:50 am. My wife hit the reset button and our daughter tried calling the front desk, no answer. Our room was just around the corner of the front desk. It went off a second time not even 10 minutes later, once again reset it and tried to call the front desk still no answer. My wife went out in the hall and saw a couple of Police Officers and they said they were trying to find someone as there was no one behind the desk. The third time it went off I got dressed and went out to see what was going on, the police still couldn't find anyone in charge. The alarm kept going off every now and then, but it wasn't tripping a signal to the Fire Department, the Police finally called them. Talking to the Police I asked if the alarms I each room were linked because we were on the 1st floor, but if there was a fire what would alert the people on the 5th floor. he said all the rooms in a building like this usually are linked. By now a third officer had arrived and was calling around on the phone to get a manager. After about an hour they found the night person, she was sleeping in the room across the hall from us. The Police had called the Fire Department to check out what was going on. They went in our room to see what was going on and what my wife did to silence the alarm. They had the night lady replace the batteries but it still would go off. They had found an extra alarm and wanted her to replace the whole alarm but it was hard wired into the system and she couldn't figure out how to do it. The Fire Department left and finally one of the other managers showed up. The Police talked to him and left. Meanwhile the alarm in our room was still chirping. My wife went out and asked if they could move us to another room. The manager who showed up said yes, they gave us a room on the second floor, so at 5:30am we're packing all our stuff up and moving up one floor. This was the first thing they should have done. I'm one who once they're up they can't go back to sleep but the rest of the family did. Later that day I asked the manager who checked us in if we could get something off the bill for the inconvenience he asked what I wanted, I said what did he think was fair. He said 20%. I said ok. But that was the only chance I was giving him to see what our business meant to him. I thought 50% at the least. Our son is in the Navy and doesn't think he will get any time to come home for Christmas, so we all ready have another trip planned for then, plus at least 3 next year. This was the third time we've stayed here,we wont be staying here again. Now on the day we checked out, it was just after 6am. Breakfast is 6-9am. there was only one other person eat then. I went to get some orange juice, it was empty. I then was going to get some apple juice, it too was empty. I told the desk person, he said they just ran out, they never did get more while we ate. Upon arriving for Hampton Homecomimg there isn't any parking. A LARGE FLATBED IS PARKED ACROSS 4 SPOTS. Gunnar is not pleasant , called to say we would be coming in late, nautilus told your room is already paid for. Asked for assistance regarding parking given an answer of there is a lot behind the building, but don't quote me. The elevator smells bad. The hallways smell bad. A leftover oreo cookie on the chair at the table. A stain on the cover at the bottom of the bed. The room walls are paper thin. I can hear my neighbors movie loud and clear. And a room full of loud screaming boys is on the distance not even sure where it's coming from. I can't wait to change hotels in a few hours. I'm cringing as I try to get some sleep, everything is booked solid. "What it lacks in charm it makes up for in service"
My husband, infant and I ended up here last minute this past weekend. I checked in while he was at a biz meeting, and I was a bit put off at first: the room smelled so musty, I thought the carpets had been cleaned and that it was mold. I think I was exhausted and the guys next door were blasting music, I was a bit out of sorts. That said, the carpets WERE clean, as was the bed, which I inspected (I always do, it's an anxiety thing). When I called to inquire about the smell, the front desk guy came up to the room and offered me a key to a different room, which I turned down (the baby was already making herself comfortable) and inspected the room himself. He didn't act like I was crazy when I was like "Does it smell musty?!" and, as the weekend went on, I realized the room had probably been closed off for a while. Once the guys next door turned down the music, I felt better about the place overall. The aforementioned front desk concierge, RaVon, was incredibly nice. At check in, afterwards, and during the Smelling Incident. He was friendly and always asking what we needed, as were the other concierges, but I didn't get to know any of them as well. Our housekeeper, Tamara, was incredible-- she worked around our schedule (infants!) and gave us extra necessities to make our stay with a baby easier. She was efficient and fast and really an interesting person. She offered us all sorts of suggestions for local activities to keep the baby busy, and they proved to be incredibly helpful. Overall, it's your standard hotel. The room wasn't huge, the bathroom was tiny, but it was clean and in my experience it was made better by the people who work there. You can tell that the hotel was once nice, but it has not been kept up properly. The housekeeping staff was sorry. One day no cleaning, the next day only bed lines changed no bathroom cleaning, no towels, no vacuuming. Of course I spent the majority of my time outside the hotel. But the time I spent in the room and at breakfast was crucial to my stay. The only thing I can add to what I have indicated above, is that the coffee was first rate. Thank you for acknowledging our efforts. As I told someone else, guests like you are our lifeline. Again, thank you. I enjoyed my stay as always. I just wish I stayed longer. The service was excellent and the staff was very helpful. I will be staying again real soon. They have complimentary continental breakfast which was good. The hallways are always clean. It is so quiet. I would recommend this hotel to everyone I know. Thank you very much for allowing us to be of service to you. Comments like yours keep us motivated to strive to do even more for our guests because without you, we would not exist. Thank you again. "My First Visit to Hampton, VA"
This was my first visit of many to Hampton, VA. I loved the city and the atmosphere. 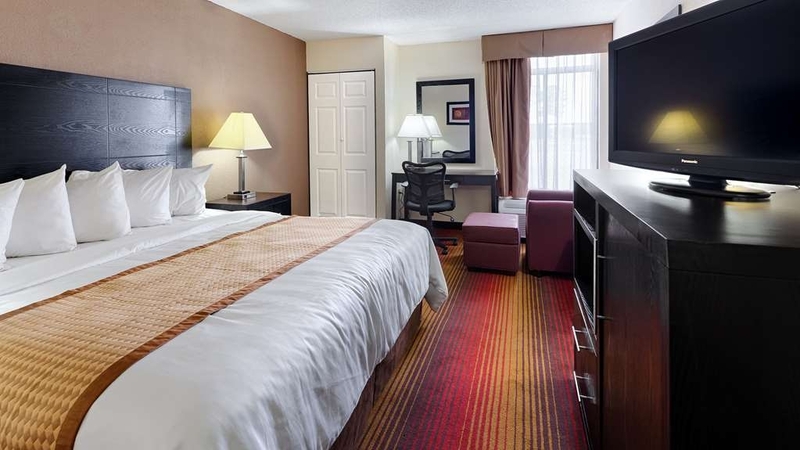 The location of the Best Western Hampton Coliseum Inn was perfect along with the comfort. There are a lot of activities close together. Fishing was our main purpose of going to Hampton. But after being there we plan to engage in the many offers of entertainments: Such as the movies, shows, shopping, and choices of eateries. Can't wait to go back. Need to pay more attention to safety issuse had a fall in the bathtub becase there was not mat or strips . The room was not cleaned very good I had to have the person from the front desk come and clean . . STAINED TOWELS, HAIR ON TOILET, LIP MARKS ON WINDOW, BUGS ON AIR COND, THINGS ON THE FLOOR. IF YOU BOOK A ROOM HERE MAKE SURE YOU CHECK THE ROOM !!! We needed a place to stay for a couple of nights and this fit the bill. It was comfortable and convenient, and we couldn't beat the price. It is close to a lot of fast food and mid-line restaurants with the new town center development nearby. We would stay here again. This hotel was a good price through Expedia with hot and cold reviews, so I decided to take a chance.after driving for 12 hours it was a pleasant view. The first entrance door was broken so don't carry too much at once. Upon walking in ,I was pleasantly surprised to the clean and modern decor.the check in process was ok,but not very business like. I was pleased upon entering and the air was already on .the room seemed clean but as I pulled back my covers to my bed I was horrified to find out my sheets were not changed! Stains were every where. I quickly called down and asked for clean sheets. The attendant brought more to me and I had to change my own sheets. Breakfast is offered but it lack luster. 1 waffle maker, I'm guessing powdered eggs,sausage, stale cereal, donut holes,yogurt, toast. There was 1 long table to sit, some guest said they would go to another hotel to eat. The halls were hot.ice machines on 1st and 3rd floors. Although ,I didn't swim,there was a small pool that appeared to be clean and refreshing. Checkout was easy but again the desk was far from professional complain about customers on the phone and I was charged more than I booked for through Expedia. They told me I would have to take it up with them. Overall, I would stay there again if I had to,but it would not be my first choice. I would have expected more from them expecially since they dropped the ball on the very 1st day. My crew and I travel a lot and your Hotel along with the staff met all of our needs, We stay in a bunch of Hotel's through out the week all over the state of Virginia and my crew was completely satisfied with the rooms and the Breakfast so in closing , Thank you and we look forward to staying at your Hotel in the future. "Hotel Used As Overflow For My Family Reunion"
My family had booked several rooms at the nearby Embassy Suites. I thought it best to book a couple of rooms at the Best Western because the property was across the street. The personnel at check-in/check-out were very professional and pleasant. They were able to process the requests of many young athletic guests patiently, professionally and allowed the wait time for me and my guests to be minimal (I appreciated this greatly). Service throughout my the time at this property was enjoyable and no problems were encountered. 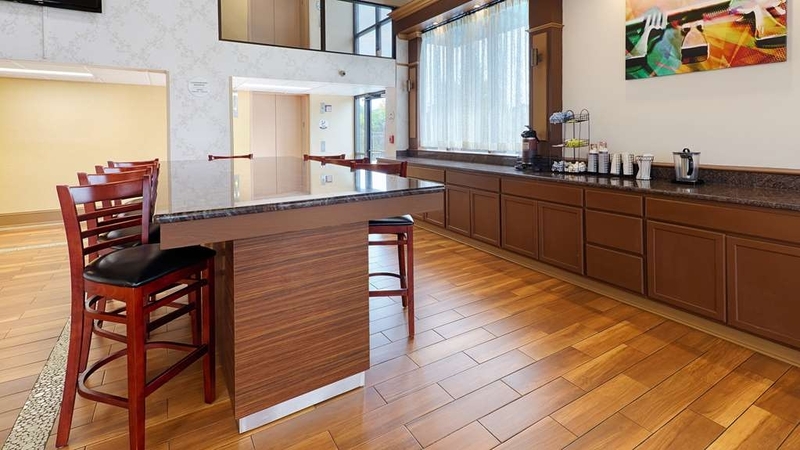 We chose this property solely based on location & price, due to a family reunion nearby. OK overall, but don't expect more than a mere motel experience. The check-in was weird, to say the least. Very little professionalism. Arndrel has no idea what he's doing. He and the other front desk agent were either talking over each other or both saying the same thing to us. Parking is VERY limited if house is full and my *future Mom* is handicap, so it was very disturbing to notice that the ONLY car parked in 1 of the designated spaces w/o a placard, (wait for it)....was the managers Mercedes!! After I complained to the front desk, he came out & moved it. Be sure to pull your door close, 2 of our 3 rooms didn't seem to close by itself all the way-which is a major security issue. The property has a pool and offers breakfast, but I wasn't interested in either because I kept staring at the Embassy Suites through the elevator windows wishing I was there-sigh! We booked at Best Western because the Embassy Suites was full. The price was reasonable and the room was comfortable and clean. Check in was easy and the Thursday evening staff was very friendly. The pool, business center and fitness rooms are a bit small but overall nice. I would recommend this Hotel to travelers who want a good nights sleep for a good price. "Perfect Price, comfortable, great breakfast. Staff are incredible." I had a comfortable, quiet night with low noise level coming from working conditioner. That is different from that hotels whose prices are slightly cheaper. Bath and carpeting in the room were clean too. The only thing is bed sheets were worn moderately but hopefully clean. Not the newest hotel, but very clean and the staff was outstanding from front desk to housekeeping. A great value from top to bottom no doubt about it. Has are most enthusiastic recommendation possible. Like another contributor, this was the only hotel available during the Jazz Festival Weekend, there was however a reason for availability! First the positives, could not fault the staff who had a positive approach and were friendly and helpful. Windows in our room were not double glazed and therefore noise from the hotel next door penetrated, as this was the Jazz Festival weekend this went on till 4am. Am unsure why the manager could not have organised an invite for us to the party, so this wouldn't have mattered! The curtains had holes in, beds were old and dated. The loo was broken, came off the wall when seated, sink taps leaked, water went all over the place when used. The floors in bedroom and bathroom were dirty, but when I saw the vaccum cleaner and cleaning materials the cleaner had been given to do her job with, I wasn't surprised. Management need to invest in supplying effective cleaning equipment to support the cleaners work. All in all, underinvestment here, refurbishment urgently required. For over 150 USD a night, this hotel really was appalling. I travelled here from the UK for the jazz festival and this is a sad representation of a US hotel. "Clean room; great staff; some repairs needed"
We've had good luck with Best Western properties before and this one was available at an affordable price and it was in a "central" location to all the things we wanted to visit in that part of VA. The room was very clean. The bathroom was tight but we managed. There were some minor repairs needed in our bathroom but nothing that kept us from using it---faucet drip, sink stopper broken, exhaust fan very loose in ceiling. We were gone all day, every day, so this met our needs for a clean place to sleep and bathe. The continental breakfast had a lot of choices: bacon and/or sausage all 4 days we were there, waffle set-up, pastries, juices, etc. etc. The breakfast area was not in the most convenient location as the hotel entrance/exit through the lobby to/from elevators was a narrow path between the food on one side and the table on the other. Overall, our impression of the hotel was favorable and would stay there again if in the area. Very friendly, helpful front desk staff. Always felt safe in the parking lot and hotel. "Not clean, noisy location - not recommended"
Selected this hotel because most of the others were fully booked for an event at the Coliseum. The location is very close to the Coliseum an easy 5/10 minute walk if you are attending an event. The room was not clean, carpets were dirty, bathroom had not been cleaned. We cleaned the window so we were able to see out of it. The drapes had holes in them letting in light. The hotel next door had loud music playing until 4am keeping us awake, it was amazing that no one complained. I have stayed in other hotels in this area, this was chosen because there was nothing else available. I would strongly recommend selecting a different hotel. It is a very tired hotel with little money being spent on the upkeep. One member of staff on reception was very helpful, that was the only positive. The hotel has an outdoor pool (although I never saw anyone using it), free breakfast, free wi-fi and free parking available. Rooms had refrigerator and microwave, I liked the fact it had a table and chairs rather than a desk. The room was uninhabitable and I was charged for a night, despite the fact that there were no other rooms available. Dirty bedding, floor had large chunks of dust and hair, wet towels, molded shower curtain, leaking shower head, cup stains and crumbs on the table, and detached floor border. My overall experience was great here from the employees to the room. This was one of the best hotels for the price! Great breafast offered. The king room was an excellent size and exceptionally clean. I will definitely stay here next time my family and I are inthe area. We stayed at this Best Western last summer while in the Hampton area and found it to be very clean with good service. However, we were disappointed in this stay. The breakfast was very poor on Sunday morning and items were only restocked once guests complained. The room towels were stained and the chair and footstool in the room were also ragged and stained. Not sure if there has been a management change or what, but definitely not as good as last year. I booked 10 rooms for a bowling tournament in April. I got great compliments for booking this hotel -- each guest was greeted by her name every time the front desk saw her; the front desk would ask how they could make her more comfortable; ready and able to give directions -- in other words my group was treated like they were the only guests in the hotel and were provided 5-star service. Hotel was quiet and well managed but the upkeep can still be better in the rooms. Maids seem to want to know problems rather than telling the desk. Maid forgot to empty trash in room and vacuum floor. They offered clean rooms,rates affordable, close to everything like restaurants department stores, you can walk if you wanted too. Breakfast included, parking free and they have a pool and gym optional for use. "do not stay here, beware"
I was given a room on the first floor upon check in. The room was dirty, cob webs were all on the walls, the toliet was running. I immediately went to the front desk to request another room. The second room wasn't any better, the room was dirty, the TV did not work, the shower head was broken. I Booked this hotel for 3 nights.Due to my long flight, I decided to wait until the AM, to voice another complaint about this room. In the AM I went into the bathroom and I saw a roach crawling on the bathroom door. I immediately packed my things, headed to the front desk, told the person my complaints and requested to check out early. I wasn't charged for the one night. However, I will never stay at this hotel again. The rooms are filthy and the hotel has a pest problem. 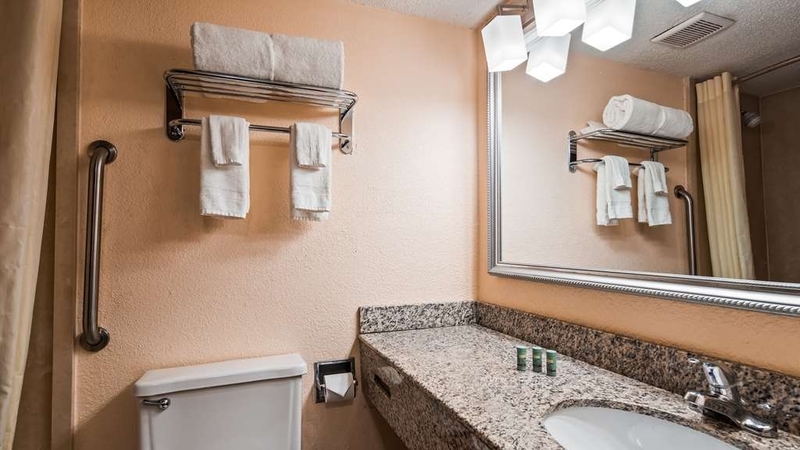 I booked my remaining stay at the Holiday Inn Express and I wasn't disappointed. Don't waste your time or money at this hotel. Excellent customer service!! The front desk clerks Pierre and Ravon were so helpful and very nice. My 3 kids and I stayed for just 1 night but it was so nice we will definitely be visiting again. The rooms and the lobby were very clean. The pool was nice and quiet. I would recommend this hotel if you are in the area and need a nice and clean place to stay. This hotel was a good price and the bed was comfortable. However we booked a non smoking room, and there was a distinctive smoke odor in the room and cigarette burn holes in the window drapery. Didn't bother to complain b/c we were only staying one night. Not sure I'd stay here again . This hotel is practically next door to the coliseum and convention center, so the location was perfect. The free breakfast was pretty basic, but it included most of the traditional breakfast items (bagels, waffles, cereal, sausage, eggs, toast, juice, coffee, etc). The room itself showed its wear in subtle ways. A leaky faucet, a touchy thermostat, but it was still comfortable and spacious. The staff was exceptional. They were each very friendly and helpful. I would not hesitate to stay here again! We could not have asked for a friendlier, more courteous and professional staff. The outside pool was closed and the room was pretty normal but the staff was unbeatable. I would highly recommend this property. "good place to stay for the price"
My son I stayed at this hotel for two nights.The location was excellent for his event at the Boo Williams sports complex and other venues as well.The employees are pleasant and very friendly and the breakfast is good.My only complaint is minor the handle on the toilet was loose but functional.Over all great place to stay for the value. "GREAT ROOM GREAT STAFF GREAT PRICE"
I stayed here with my boyfriend Thursday - Saturday at the end of April (21 - 23) to attend an airshow at Langley Air force Base about 8 minutes away (driving). I want to say how convenient this spot is. You are of walking distance and short driving distance to many good places: Hooters, Burger King, Golden Corrale, NASA museum, AMC movie theatres, choose your poison! The room was clean, adequately ventilated and everything was working the way it was supposed to. I had no problem with the water -- it was nice and hot. The AC worked properly and quickly. You get free wifi! There was no noise from nextdoor neighbors or outside. I had the best sleep during my stay. No problems with comfort at all. I was so sad to leave this place. It is a small hotel but the staff remember your faces. I wish I had names to mention in this review but I have not had a problem with the staff. There is free daily breakfast starting from 7 to 9. It isn't gourmet, but the food is breakfast food! What do you expect! From cereals, eggs, sausage, fruit, yogurt, bagels, munchkins, danishes, and more. Overall, if I plan the next trip in Virginia, I am definitely staying here again. For what I paid, I had lower expectations but this beautiful establishment really caught me by surprise. Thank you for having us and making us feel welcomed. We are pleased you were satisfied with us. Please stay with us again when you return to this area. Overall this is a very good hotel. Centrally located to many eateries and shopping. The hotel itself can use an upgrade to the breakfast are. Other then that it is a very good hotel. The staff were very professional and friendly. Thank you for letting us know where we need some improvement. We will do our best to make some changes in the breakfast area. Again, thank you. I enjoyed my stay, always. I don't stay anywhere else because the staff is friendly. My room is very comfortable. I would recommend this hotel to anyone. The complimentary breakfast is really good. It really is a great place for out of town guests. Thank you for your comments on our hotel. It is so encouraging to the staff that someone notices their efforts. We'll be glad to see you again, Shannon. Thank you, Kenneth, for your positive view of our hotel. We are greatly encouraged to hear that our efforts have not been in vain. We hope to see you again soon, even if it during a vacation. There much to do around here. Again, thank you. Thank you for your review of our place. Comments like yours help us strive to present a clean and hospitable environment to our guests. We hope to see you in the summertime. Again, thank you for allowing us to serve you. Picked this hotel due to the closeness to the facility of the tournament I participated. Must say I made the correct choice. The reviews were excellent and after the stay can say were very correct in their evaluation of the acumination's and staff. Staff very friendly, accommodating in every way. Rooms were clean and homey feeling . I will use this facility on any return trips to the area as well as recommend to others. Thank you for your excellent assessment of our hotel. I will share your words with the staff so that they can see that their efforts are not in vain. We'll be looking for you to return. Again, thanks. I really enjoyed staying at the hotel. Everyone was nice and friendly. The room was very comfortable and I love that the hotel was so close to everywhere that I needed to go. I will be staying at this hotel again in the future. Forgive me for not thanking you for staying with us much sooner. Your comments are just what we need to continue to strive to make your stay a comfortable one. See you again soon. Thanks again. The hotel was described as a "no frills hotel" by our conference people. I must admit it had plenty of frills! We had such a wonderful reception by their front desk staff. Upbeat and bubbly! 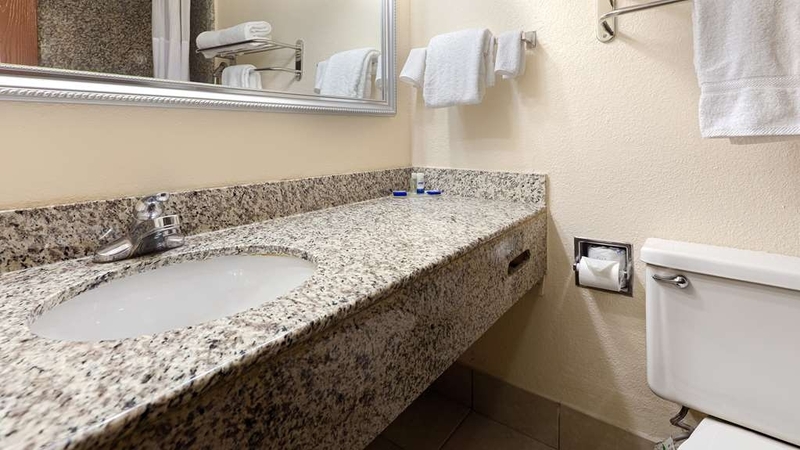 The lobby was updated, the rooms were clean with nice furniture, bed linens, granite counters in bathroom etc. Beds were comfortable, halls were quiet, breakfast was hot and restocked constantly. The front desk help even lent his personal charger for our cell phone we forgot at home. The cleaning person was so cheerful and sweet! I've stayed at other Best Western's years ago and have found them hit or miss- but found this one a real hit!!! The tub diverted didn't work, so we were unable to take a bath: shower only. The shower head only worked on one setting. The pillows were very lumpy. We didn't sleep well. The the positive side, the place was clean and quiet. Trip Advisor needs to lower the character count. Probably one of cleanest Best Western that I have stayed in. If have to go back to Hampton Virginia I would consider staying at this best western again. The room was clean and the beds were very comfortable. The staff was very courteous and prompt at check-in as well. We came up for a poker run and had to book at the last minute. The hotel was a little more expensive than we had planned but well worth it. The lobby is beautiful. The breakfast was delicious. The bed was very clean with plenty of pillows. The space was probably the largest hotel room i have personally been in - maybe I don't get out much... but it was really great. Could have gotten my whole family in one room and everyone would have a place to sleep... for a great price. Good morning Barry! Thank you for that wonderful review. We are happy to hear that your stay with us was a great one. As far as the size of the room... its a great thing to hear you had plenty of room. Any time you are in the Hampton area we hope we will be your choice of rest and comfort. We can't thank you enough for taking the time to write this review. Take care until next time. We enjoyed staying here as location is close to mall and also close to good restaurants. Staff at this hotel is very friendly and polite. The breakfast was also good. Rooms are clean. We will recommend this place. Thank you Deandre for this wonderful review. We are pleased that your stay with us was a pleasant one. Our hopes are that you stay with us any time you are in the Hampton area. We look forward to seeing you soon. We had a very good time during bassnectar event at hampton coliseum , hotel staff was excellent. hotel was clean and tidy,breakfast was good over all our stay was very comfortable. We enjoyed. We will be back next year for the same event. Thank you for this wonderful review Melissa. We are pleased to hear that your stay was a great one. We look forward to having you back! Great staff. Nice hotel. All around pleasant stay. Convenient access to parking, shopping, eating and entertainment. Would stay again and recommend to anyone staying in the area. Price was surged for event at Coliseum, but still reasonable. Thank you for taking the time to write this great review. We are pleased to hear that your stay with us was a pleasant one. If ever you are in the area we would be more than happy to accommodate you. Happy New Year to you and we hope to see you soon. "the free breakfast was great, clean hotel"
the hotel was clean but not very updated. the room we were in smelled like incense. that could be good or bad :) the free breakfast was good. free parking. located in a central area. the employees were very nice. Thank you Mr. Mark for taking out the time to write this review. We greatly appreciate your feedback on your stay. Breakfast has been one of our top priorities to improve. We would love to accommodate you in any future visits to the Hampton area. Great service and location at the price we paid for the night. The room had all amenities required. Even the breakfast was good. The staff was very very caring. Over all we enjoyed staying here.We will come back. Mr. Larry thank you for taking out the time to write this wonderful review. We are pleased to hear that we could accommodate you while you were in the area. It's always our pleasure to help our guest to have a great experience. We can't wait to see you again! I had a very good sleep after driving my truck all the way from Ohio to Virginia. I had no problem parking my truck. This was very convenient as I did not had to worry about my truck parking. I would stay at this place only. Mr. James we are pleased to here that your stay with us was a great one. We recently repaved our parking lot and have more space to conveniently have our guest park well. We look forward to seeing you any time you are in the area. Thank you for taking out the time to write this awesome review. I thought that this was a nice hotel with great staff! Everyone was so nice and helpful... always saying hello and good morning as I walked through the entryway. My room was comfortable and had everything that I needed - tv, cable, refrigerator, microwave, coffee machine, and a lot of pillows. I enjoyed my stay. It was a little old looking, but it still had everything that I needed, and it was always very clean. No problems in the three nights that I stayed there. Thank you Tracey for taking out the time to write this great review. We pride ourselves in being a friendly and clean hotel. We would hope that if you are ever in the area that you would stay with us. We love seeing our guest happy and comfortable. We enjoyed staying here. all the staff member were very polite and helpful during our stay. We also enjoyed the restaurant recomended by the young staff member working evening shift.He was very knowledgeable about Hampton area. Again we really enjoyed staying at this place and we will stay here again. Thank you Ms. Linda for taking the time to write this lovely review. It's was our pleasure to hear your stay with us was a great experience. Mario is very knowledgeable about the popular places to dine in. Again thank you for allowing us the opportunity to accommodate you. We look forward to seeing you soon. We had a very comfortable stay, this location is very close to Hampton Convention Center which served our purpose. We enjoyed staying here,the staff was very helpful. We stayed at this hotel for two days and we enjoyed breakfast. We will stay at this place again. Ms. Jannett thank you so much for taking out time to write this wonderful review. We pride ourselves in not only giving you great customer service but providing an experience. When in the area we would love to be your hotel of choice. Have a Happy Holiday and we hope to see you soon. It was as close as we've ever been to the convention center. The hotel staff were great every single one of them. We didn't have any issues at all. The hotel was run down a little. The bed was not as nice as some of the places we've been but it was clean. It had a desk but the WiFi sucked. I had to use my mobile hot spot the entire weekend. I just could not get it to do what i needed if i could even stay connected to the hotel WiFi. When I travel I have not only business that I have to conduct but school work i have to do and it was the pits. On an up note the breakfast was superb for a continental and the walk to the convention center was short. The convention was as great as ever, we had a lot of fun. Ms. Crystal thank you for taking the time to write this review. We love to hear feedback from our guest. I apologize that you were having an issue with the WiFi. I can assure you the problem with staying logged in or bad connection has been resolved. It's a pleasure to hear that our staff was "great" and the breakfast was "superb". Our hopes are that you would allow us to accommodate you whenever you are in the Hampton area. The rooms were clean and the environment was very pleasant. The staff was extremely pleasant. They seemed to take pride in their roles and were very accommodating to their customers. They were very diligent in keeping the buffet stocked ensuring everyone was satisfied. Thank you for taking the time to write this wonderful review. We are pleased to know that your stay was a pleasant one. Great customer service are one of our main priorities. We would hope that if you are ever in the area that you would always make us your place to stay. Our hopes is to see you soon. Take care until then! Thank you so much Mr. Jerry for writing this great review. We pride ourselves in great customer service. It was our please to have you at our location and the cookies and popcorn is a great hit with all our guest. Thank you for the feedback. We would love to see you soon when you're in the area. "Nice Hotel for price paid"
We used the government rate to book as my sister is a government employee. This hotel is a short distance to the coliseum where we were attending a concert that night and we could've walked if it weren't rainy and cold. Everyone was really friendly and helpful; breakfast was included in the rate but not that appetizing... Also rooms should probably be inspected more our door was very hard to open and close, shower sounded like it was running after we turned it off. Housekeeping never replaced towels after cleaning the room so we had to hassle the front desk for more in the evening..not sure why because who washes their face with the same wash cloth they used the day before?? #gross Overall nice hotel the housekeeping staff should just pay more attention to details....it really means alot! Thank you for taking out the time to write this review. We apologize for any inconvenience and issues we've caused during your visit. All of your concerns and disappointments were addressed and fixed. Thank you for making us aware of them so that we may correct them. We would hope to see you again in the future if ever you are in the area and need accommodations. Also the breakfast items are being upgraded and we are working on making it more appealing to our guest. We value your suggestions and concerns. Very clean hotel until Sunday morning of a two night stay. There were some raucous parties on our floor Saturday night, judging from the trash in the can by the elevators, the amount of noise and the overwhelming cigarette smoke in the hallway. That being said, we were there on a very busy weekend for an anime convention so the customers that weekend were young and having fun. The staff was pleasant an the room was clean. The exhaust fan in the bathroom dripped so we got a little shower every time we sat on the toilet. Other than that, it is a nice hotel. Thank you for taking the time to write a review. We sincerely apologize for any inconvenience during your stay. We were unaware of the celebration and smoking occurring until notified by our guest. Then which we promptly handled the situation. Also please know that the bathroom issue was fixed as well at the time of you notifying us. We try our best to make sure all issues and problems are handled in an efficient and timely manner. Thank you for allowing us the the chance to accommodate you. We hope to see you soon whenever you are in the Hampton area. Overall this was better than I thought it would be. Thanks to all the other reviews that helped me to make a well informed decision to stay here. It was very nice. We only stayed two nights but it was well worth it to stay here for the price. I look forward to staying here again. Thank you for taking the time to write this nice review. We pride ourselves in making every guest stay an enjoyable one. We appreciate you giving us the opportunity to prove to you that we are better and improving everyday. We looking forward to seeing you soon. Take care until we see you again. The hotel was very clean and friendly. The coffee was awesome. The room and bathroom was very clean. Some people have complained about the shower or water pressure, we found it to be fine. I would not have any problem with staying here again. the price that we paid was better than the other hotels close by. The staff was very accommodating and professional. The rooms were nice and clean. The breakfast had a variety of options and it was different everyday throughout my stay. The location of the hotel is very convenient as it is right by the interstate and there is a lot of activities to do around the hotel. Thank you for your stay and this great review. We are pleased that we could accommodate you in your visit here in Hampton. We look forward to being your hotel of choice whenever you are in town. See you soon! We had a very good experience stay at this location, our stay was not to long but we enjoyed and had a good rest on our way to NC. We would stay again, This location is very close to many restaurants and shopping mall. Thank you for your stay with us. We are pleased to hear that you were able to accommodate you. Our hopes are that you would consider us any time you are in the Hampton Roads area. We also appreciate this lovely review. See you soon! "Nice place, but had 1 issue"
The cookies were tasty and welcome. The breakfast helped get me through 2 races that weekend we stayed. The staff was friendly and welcoming. Wireless worked well and the room was nice. The only issue we had was that our bathroom flooded when the guy upstairs took a shower. Luckily we were checking out that morning so it didn't cause us a major issue. Thank you for your stay with us and taking out the time to write this review. We sincerely apologize for the issue you had towards the end of your stay. Thank you for bring that to our attention so that we could handle this in a timely and efficient manner. We look forward to seeing you in the near future. Again thanks you for entrusting us with your stay here in Hampton. I selected this hotel because of its close proximity to the Hampton Coliseum where I was participating in weekend races. I originally considered the adjacent Motel 6, but was unable to get a room - and I'm very glad now that I couldn't. 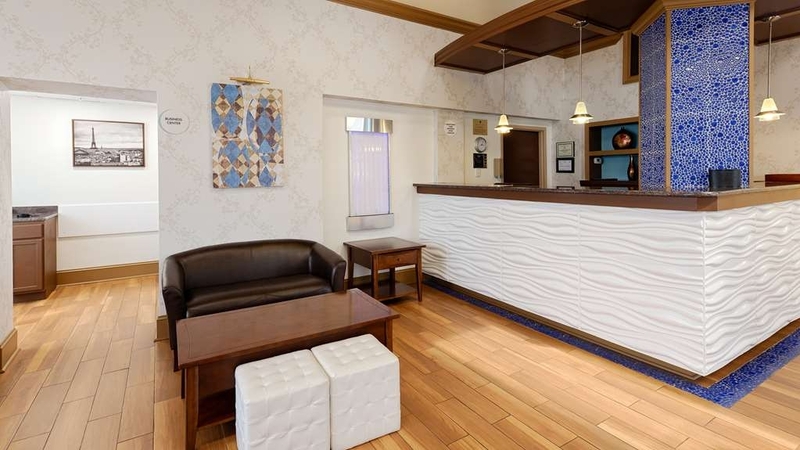 This hotel is in very good condition, very clean and the staff are simply wonderful! I will definitely stay here again in the future and would recommend the hotel to anyone looking for accommodations in the area. Everything considered, I found this hotel to be an excellent value for the quality of accommodations and service received. Thank you for staying with us and taking out time to write this wonderful review. We are appreciative for your comments and pleased that we could accommodate you. Our hopes are you stay with us for your next Hampton Roads visit as well. The room was clean and fresh. The staff was very accommodating and friendly. The breakfast every morning was delicious. The price was affordable and there were many free amenities. The fitness center looked very nice, clean and renovated. It was cold but the pool looked nice. Thank you for staying with us and taking out the time to write this lovely review. We are happy to hear that we could accommodate you on your visit here. Hopefully you are able to visit us in the summer months to experience our pool area. We would love to have you back soon. The stay was short but sweet. Got a lot of rest and the rooms were clean. Was expecting a borining Continental breakfast but, was delighted to see hot items also. There was fresh baked cookies and popcorn in the evening. Will stay again. After reading the comments I had my doubts about this place. But reluctantly decided to stay anyways. Upon arrival to the hotel I was greeted and checked in immediately. The room was nice and cozy and quiet. I slept really well. In the morning I was suprised that there was a full breakfast, as I was told that it was contininental. I will definitely stay here again. This hotel is really close to alot of restaraunts and shopping. The rooms are clean and spacious. The have a hot breakfast and the staff is very friendly. There was really no need to move the car once i got there. The staff went out of their way to provide me with everything that I requested. I will definitely stay here again, or at any Best Western. this hotel provided excellent customer service and breakfast was very good for the value paid. It was very close to the towne centre and the front desk helped me out to find a very good steak house and i really enjoyed staying there. The hotel is clean, the pool, staff, and breakfast are great. It is located right down the street from the Coliseum and a mini mall with several eating places in walking distance. It is also on one of two main highways in Hampton/Newport News and right off of I-64. For the price it is the best hotel on the Coliseum strip in Hampton, VA.
My uncle booked a bunch of rooms for our family for his son's wedding. The hotel was in the heart of all the shops/chain restaurants in the area and close to their home. Another pro is that all of my crazy family was staying in one spot, so we got to spend time together. I believe he got a rate of $65/night for the room. It has an outdoor pool, no lifeguard, so swim at your own risk, but they do supply pool towels. It was clean and we enjoyed the use of it. The breakfast selection during the week is not the same as it is on the weekend. We stayed Thursday- Sunday. On friday it was basics, muffins, rolls, bagels, fruit, yogurt. On the weekend they rolled out the hot food (waffles, eggs). The rooms had been recently renovated, so I can't complain about the decor, the sheets/linens were clean and the room adequate for our purposes (we were there to sleep). The front desk man was very helpful and friendly. Their coffee is serviceable. Would I stay there again if I had my choice? No. It was just easier to roll with the family plan. If you are on a serious budget and need a clean place to stay that provides breakfast, this will fit the bill.